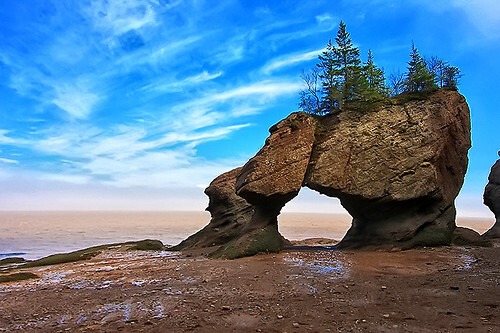 The entrance fee for Hopewell Rocks at the Bay of Fundy is good for two consecutive days to allow visitors to see the rocks in both high and low tide. There are a number of potential “Tide Compare” combinations on Flickr, but I’ll share just one. This comparison is courtesy of Jim Loftus, who visited the park in 2005. 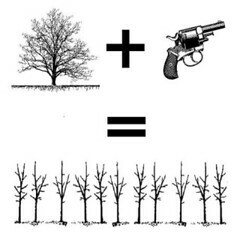 Last February, I did a post entitled Guns for Reproduction where I talked about how a shotgun helped collect pollen for the American Chestnut Foundation‘s breeding program. Yesterday, the Richmond Registry in Kentucky published an article with another example of shotguns helping the American Chestnut. This time, the firearm is used to spread collected pollen on flowers 35 feet in the air. So, Willis, 37, floated a helium balloon filled with chestnut pollen into the flowering canopy and blasted it apart with his shotgun. If the tree produces chestnuts in October, he’ll know it worked. Read the full article at the Richmond Register. Every 25 hours, 100 billion tons of water moves in and then moves back out Canada’s Bay of Fundy. With the water level changing on average 35 feet daily, it is one of highest tides in whole world. The tides, along with glaciers, wind, ice and a whole lot of patience have created unique rock formations along the shoreline. The formations are called “Flowerpot Rocks“. Why? Although these rocks are isolated and are often surrounded by water, trees continue to grow on top. Tenacious, determined and, most of all, beautiful. 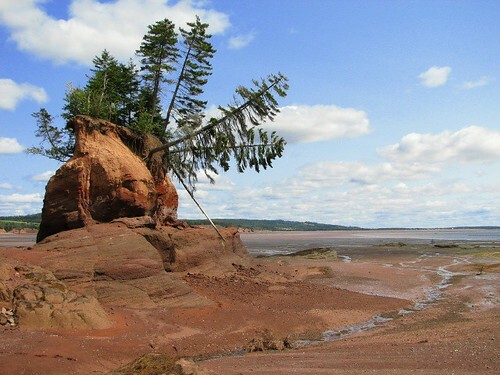 Meet the trees of the Bay of Fundy. 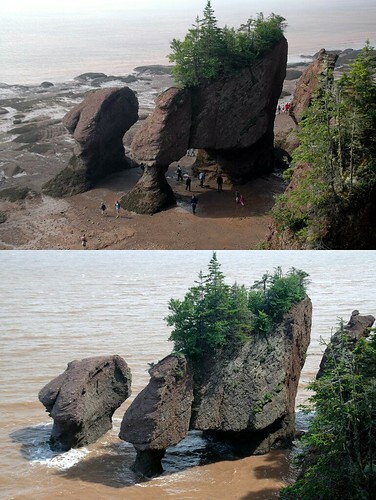 You can visit some of the Flowerpot Rocks in both low tide and high tide at Hopewell Rocks park. More information can be found at the park’s website. This week’s Weekly Winners are brief and close to home. No big adventures like Jet Skiing were had. Just pleasant and peaceful summer days in Elizabeth City, North Carolina. Be sure to check out more of Weekly Winners out at Sarcastic Mom! As I read Kimberly Brubaker Bradley’s Halfway to the Sky, a book about a 12 year old girl’s section hike on the Appalachian Trail, I kept my eyes open for inaccuracies, particularly when the girl reaches parts of the trail I was familiar with. For the most part I was thwarted. For example, when I got to the May 1st chapter, I read this line when the characters arrive at Pine Swamp Shelter which is under the jurisdiction of my beloved Roanoke Appalachian Trail Club. 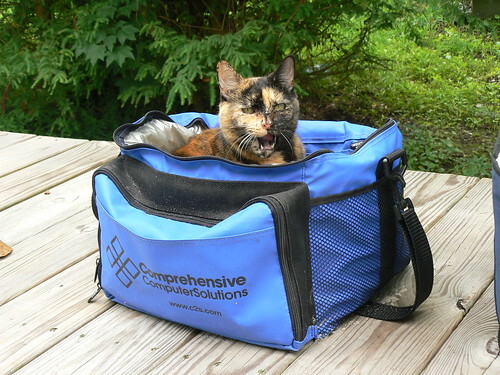 Wait a second, there are no bunks at Pine Swamp Shelter! I thought I had busted the author! Then I read on. But I did find one tiny mistake later in that chapter. The author refers to a Pearisburg, West Virginia. According to Google Maps, there is no such place. 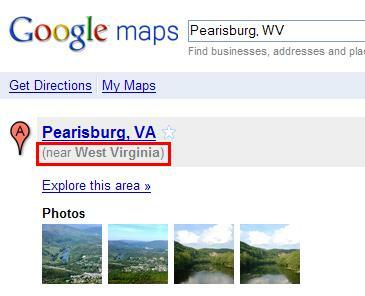 I believe the author meant the quaint town that rests below the beautiful Angel’s Rest view– Pearisburg, Virginia. 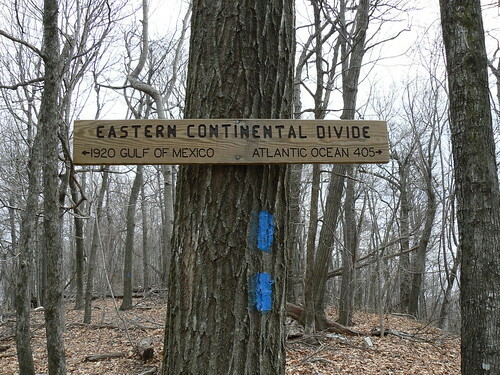 “Sinking Creek Mountain is part of the Eastern Continental Divide,” I told her. New! 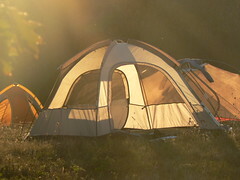 The Camping and Outdoor Adventure Carnival! Earlier this week, the inaugural edition of the The Camping and Outdoor Adventure Carnival published at Northern Camping. I’ve very much enjoyed reading and participating in other blog carnivals such as the Festival of the Trees, the Circus of the Spineless and Berry Go Round. I look forward to having a carnival that focuses on outdoor activities! And other bloggers– if you have or spot any great posts regarding camping, boating, fishing, hiking, hunting, or any other outdoor activity, be sure to submit them to the next edition! A few years ago, I bought a CD by a new punk band. It became my programming sound track, I listened to it for an entire summer while I did the backend for the Virtual IT website. To this day when I hear the songs, I feel energized and productive. The band was Good Charlotte. It wasn’t until much later I discovered the fanbase of Good Charlotte consists of me… and twelve year old little girls. Well, perhaps I have even more in common with twelve year old girls than I had thought. Following a recommendation from BackpackBaseCamp.com, this weekend I read a book called Halfway to the Sky. 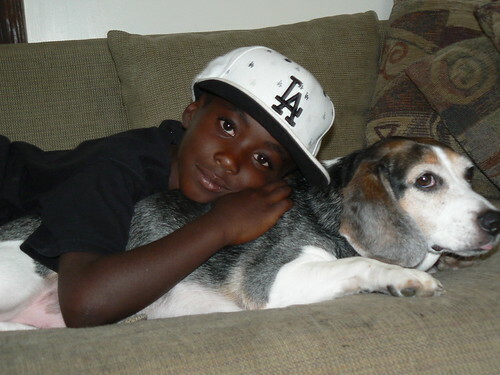 The main character’s brother recently died from a debilitating disease. Filled with grief and feeling alienated from even close family members, she decides to leave town without telling anyone and thru-hike on the Appalachian Trail to find some silence, some peace. Her name is Dani. She’s twelve. The people she leaves behind- her divorced parents. Despite being young, Dani displays a lot of good hiking sense. She trained two hours a day for three months. She was well read on all the guidebooks and maps. She saved up money for the expenses and even showed great prudence with the contents in her pack. But she forget to delete her browser history. That dang Internet Explorer will get you every time. Before she was even off on Springer Mountain, Dani’s mother, rather unpleased, catches up with her. After some drama, Dani convinces her mother to keep on hiking. Together, they complete 700 miles and finish up in an area I’m very familiar with– Catawba, Virginia. Along the way, they argue, they disagree, they grieve and they bond. Some of the plot lines and conversations between Dani and her father don’t feel genuine to me. But I did enjoy the relationship and understanding that developed between mother and daughter on the trail. Perhaps more than the storyline, I enjoyed this book as an introduction to the Appalachian Trail. I thought it did a great job of interweaving facts and trail culture into the tale. The whole book is formatted very much like a Trail Journal listing the current location, the daily mileage and the total AT mileage at the beginning of each chapter. It hit on so many little tidbits that made the story feel authentic and educational– GORP, trail magic, the infamous approach trail to Springer Mountain, the shelters, hanging bear bags with carabiners, Damascus Trail Days, trail registers, hostels, zero days, moleskin, what foods weather the best, mail drops, the logistics of doing laundry and even the thru-hiker smell. Everytime I hike with a new person, I find a new trail food to adopt for future trips. Dani and her mother are fictitious hiking partners, but nonetheless I was introduced to another trail recipe. Mom made the pudding in a zippered plastic bag with [pudding mix], powdered milk and water. We cut the side of the bag and squeezed it into our mouths. !!!! YUM !!!! The thought of trail pudding alone makes me want to leave my house and go backpacking right now. I will definitely be trying that in the future! This book is classified as a Young Adult title. Its target audience is pre-teens– twelve year old little girls. But like Good Charlotte, the author has attracted a significantly older fan.